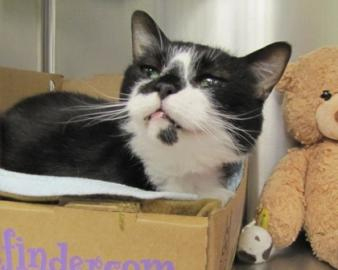 Posted on Tue, Dec 13, 2011 : 5:39 a.m.
Ebony may seem quiet when you first meet her at the Humane Society of Huron Valley, but this 12-year-old tuxedo cat loves to play and chase feather toys! She is all head bumps and purrs, with a few soft paw muffins thrown in for good measure. She was previously owned, but her owner became incapable of taking care of her. Ebony is a very gentle and sweet cat who we predict will be a wonderful lap companion in her new home. She has lived with other cats in the past, so with a slow introduction she may be able to make a new kitty friend again. Ebony would also love a quieter home, because as far as we know, she hasn't known small children, and her laid back personality tells us that she's going to be most comfortable in a low key kind of home. She's been a little quiet at the shelter lately, and we are so hopeful that someone will visit her and fall in love — this senior cat needs a caring home of her own. Currently, HSHV is running a special holiday adoption promotion for our adult cats. They are available to caring homes for free during the weekends. All adopters must meet our adoption requirements. All of our cats are spayed or neutered, up to date on all vaccinations and microchipped before leaving the shelter, a cost that is included in the low adoption fee! They are also litter trained. Please stop by HSHV between the hours of noon and 6 p.m., seven days a week to visit our adoptable animals. The Humane Society of Huron Valley, located in Ann Arbor, was awarded the ‘Best Large Animal Shelter in Michigan” by the Michigan Pet Fund Alliance, for the second time in a row this year, for saving the most lives. HSHV is an independent 501(c)(3) nonprofit organization and relies solely on donations from businesses and individuals to support our community programs. Wed, Dec 14, 2011 : 1:03 p.m.
Two broken links in this story have been fixed. Tue, Dec 13, 2011 : 11:08 p.m. The links aren't working in this story.